It’s very rare that I recommend ‘small batch’ meals, especially soup. The key to weekday cooking is making enough so you can mix-n-match it into another, still delicious, dish. But this time of year, around the holidays or in between, I’m lucky if I’m home 2 nights a week! It seems that just about every evening is a holiday or birthday party, family dinner or after work cocktails with in-towners. The last thing I need in the fridge is a pot of soup making me feel guilty for not eating it. So let’s just call it what it is, a very busy and fun few weeks with little time or desire to cook. 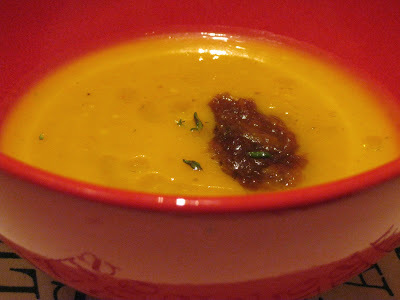 From this reality, emerges Small-Batch Butternut Squash Soup. It’s warming, grounding and healthy, all things you hope for during the cold winter months. This soup serves 2 and you’ll probably have a few tablespoons of Shallot Jam left over to smear on crostini with goat cheese. So, ok, you’ll still get a welcomed left-over, or party favor, as I like to think of it! Shop for this soup on your usual grocery store day, the ingredients are pretty durable so no stress if you don’t get to it. It will take about an hour to make, beginning to end. P.S. I call the day I cook or make a batch of soup a Nesting Day. Doesn’t it just sound comforting…? Prep squash: Using a vegetable peeler, peel rind from squash. Chop top and bottom ends off, cut at base of bulb where it gets narrow. Scoop seeds with a spoon and discard. Chop squash into bite-sized pieces. 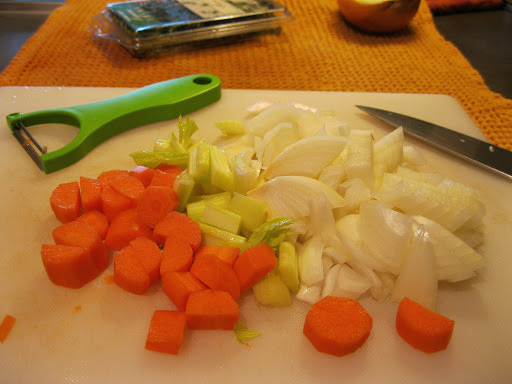 Chop onion, carrot and celery into similarly sized pieces, about 1/2″ chunks. In a medium sized pot, warm olive oil over medium/low heat. Add onions and sweat until translucent, about 7 minutes. Add carrot and celery, soften, stirring occasionally for about 5 minutes. Season with salt/freshly ground pepper. Add squash, broth, salt/pepper and thyme. Bring to a boil, then reduce to a simmer, cooking partially covered for about 45 minutes. You want the squash to be soft and falling apart. 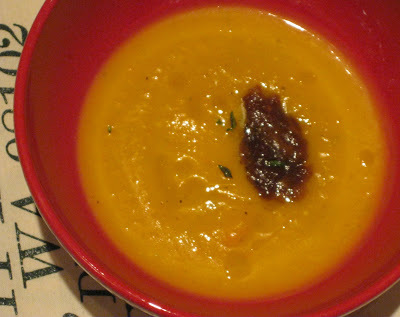 Once soup has cooled slightly, pour into a blender (or use an immersion blender if you have it) and puree. I like a few bits in my soup for mouth feel, but do what you love. Taste, season with salt and pepper if necessary and pour back into the soup pot. Warm and stir in milk right before you’re going to serve. In a small saucepan, warm 2 tablespoons olive oil over medium/low heat. 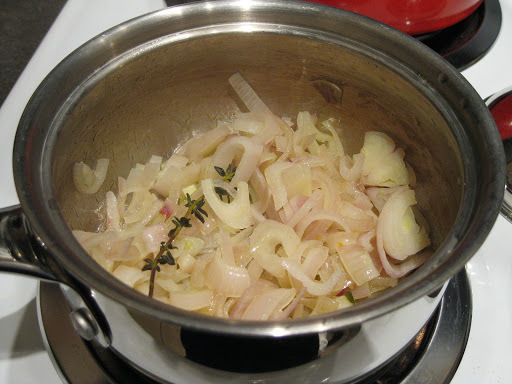 Soften onion for about 15 minutes. Add broth, balsamic, brown sugar and thyme sprig, cook about 30 minutes; stay close, this mixture has a high (natural) sugar content and can burn if the pan gets too hot. 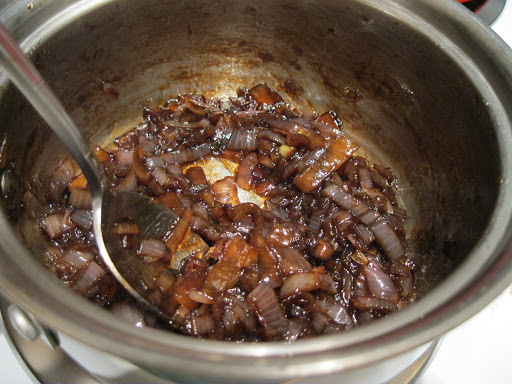 Stir occasionally; be patient, the shallots will become soft and caramelized. Remove thyme twig, as the leaves should’ve fallen into the onions by now. Season with a pinch of salt. Transfer to a food processor and whirl in the other 2 tablespoons of good extra-virgin olive oil. This mixture can be stored in a jar in the fridge for about 2 weeks. 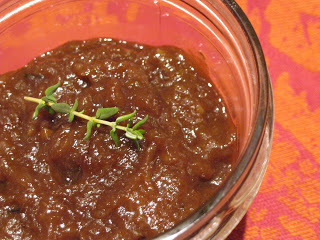 Portion soup into bowls; add a dollop of Shallot Jam, a few fresh thyme leaves and drizzle of good olive oil.